The savoury, slightly bitter flavour of chard is delicious in combination with dairy. 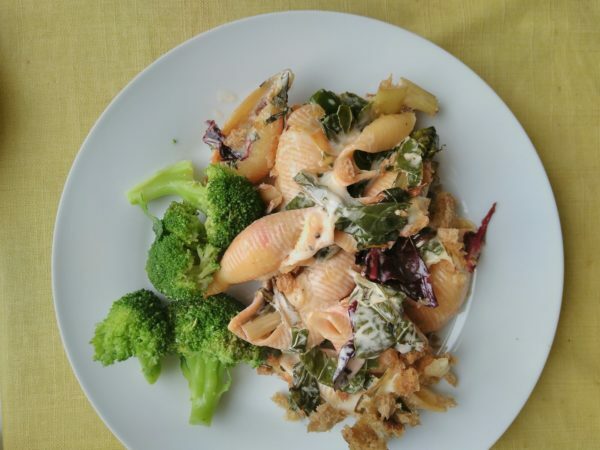 Taleggio is an Italian cheese that is perfect for melting and creates a tangy sauce for the pasta and chard for this sophisticated and quick version of macaroni cheese. This dish is best served with a simple green salad or green veg (broccoli, flat beans etc) dressed with a sharp lemony or mustardy dressing. Chop the stalks into roughly 1cm slices, and roughly chop the leaves. Cook the stalks in some butter or oil for 5 min until softened. Add the leaves and cook until wilted. Cook the pasta in plenty of salted water, according to packet instructions. Drain when cooked. Miix the chard and pasta along with the cream and tallegio. Season generously with salt and pepper. Tip the mixture into an oven proof dish. Mix the breadcrumbs with a small amount of olive oil and sprinkle over the top. Bake for 10-15 mins until the tallegio is melted, and the breadcrumbs are crispy and golden.